A strange black circle was spotted in the sky above a village in northern Kazakhstan. Baffled residents captured the mysterious spectacle on video as it hovered in the air for fifteen minutes before dissipating. Villagers living in Shortandy, some 70 kilometers north of the Kazakh capital Astana, witnessed the spooky event on Friday afternoon. “It was like a black cloud. We saw it at around 4 pm on April 3. It dissipated like smoke, but it was completely odorless,” Oleg Menshikov, a village resident, told Today.kz. 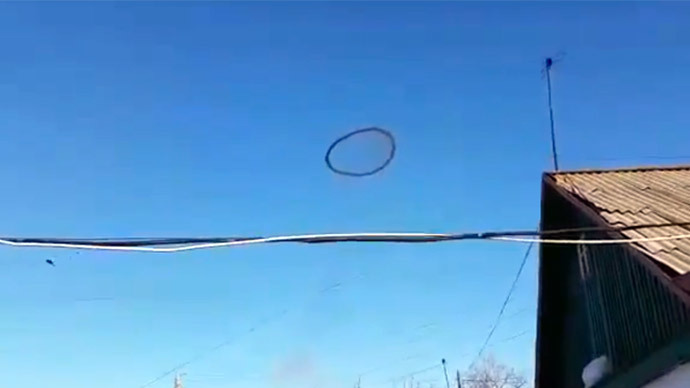 Andrey Solodovnik, associate physics professor at the Northern Kazakhstan State University estimates the ring was about 100 meters in diameter and floated at an altitude of between 200 meters to a kilometer. As to its mysterious origins, Solodnovik suggested the giant hoop was most likely a large smoke ring and was the result of combustion, a theory that confirms what most experts have said about similar circles seen in the past. Black rings have been sighted all over the world. Last April, a video of one such event recorded in Leamington Spa, England, left internet users puzzled after making the rounds on social media. Dozens of other videos featuring rings nearly identical to the one seen in Kazakhstan can be found on YouTube. Mysterious or not, some equipment is known to produce rings of smoke just like that. Smoke rings generators are rather associated with parties, like in the video below.